Keokuk, Iowa is a thriving agricultural town on the banks of the Mississippi River. Their first professional baseball team was formed in 1875, the "Keokuk Westerns". They were part of the major league National Association their first year but were excluded from the newly formed National League 1n 1876. They remained in an independent or minor league through their history. 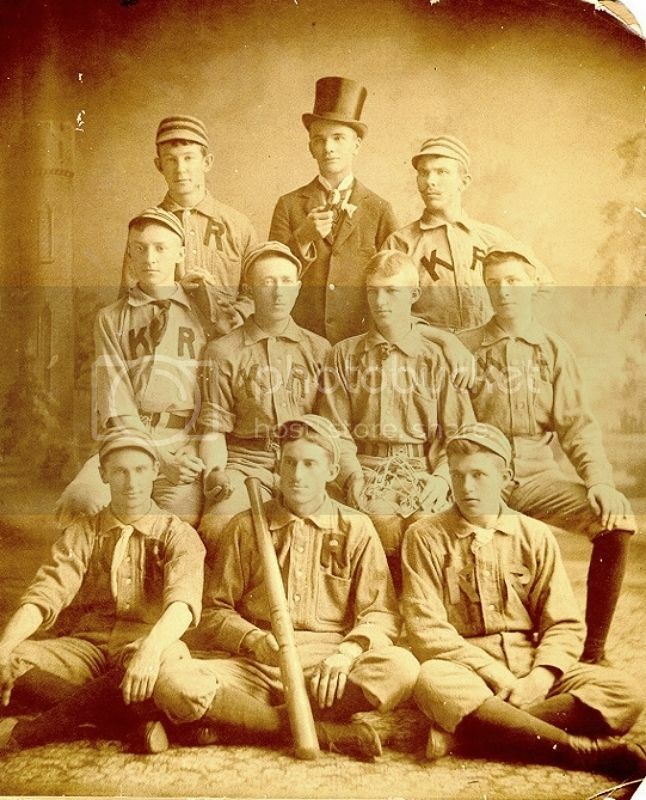 Below is a photo of the Keokuk team in the 1890's when there name was changed to the Redlegs. Former major league baseball player and prolific inventor, Harry Decker settled in Keokuk after he was blacklisted by the American Association for breaking his major league contract. He played intermittently with the local club and was considered one of their best players. While in Keokuk, Decker met and married his "child bride" of 15, Anna Burns in 1885. Harry' was eventually reinstated to the American Association and resumed his major league career. However, his erratic behavior and squandering of money led to check forgery and through the 1890's He was in and out of court and jail. Harry was in so much trouble with the law that he could not use his real name for fear of prosecution or liens against him. He had his wife Anna sign for one of his patents in 1895. Anna Burns Decker of Keokuk was listed the inventor of a catchers mitt in 1895. The patent of Decker was innovative for the method of constructing a catchers mitt out of three replaceable sections, the front face, the perimeter band and the gloved back section. All three sections were joined by lacing instead of the usual stitched seam. Decker sold her patent to Frank Brogan, Manufacturer of Baseball Goods in nearby Iowa City. This ad below is from a catalog circa 1899. note the lacing through the face of the mitt. The lacing is woven through the padding and around the outside of the perimeter band. Note the big "half-moon" pull tab end to the wrist strap for ease of adjustment and to keep the strap from disengaging from the buckle. Also note the length of the wrist strap, attaching to the outside edge of the sewn on glove. Pretty freakin' cool if you ask me. Note the patent stamping of Dec.10, 1895 on the face of the mitt. The catalog quotes extra pricing for including additional faces, perimeter bands and backs to replace worn out sections. By the 1940's the "Keokuk Westerns" became a minor league affiliate of major league teams and changed their name to the "Keokuk Kernels". As an affiliate with the Cleveland Indians in 1954, The "Kernels" most distinguished player may have been a young Roger Maris. Last edited by mikesglove on June 15th, 2015, 12:22 pm, edited 5 times in total. I did some research and found that E. Harry Decker and Anna Burns(Decker) had a daughter soon after they were married. As a result of Harry's constant philandering and erratic behavior, Anna divorced him around 1897. Last edited by mikesglove on October 13th, 2011, 3:00 pm, edited 1 time in total. here is an Old Judge photo of Harry Decker as a member of the Philadelphia Athletics of the National League circa 1887-1889. Interesting to note his mitt below. The Kernals nickname is still alive. Cedar Rapids was awarded a Midwest League franchise in 1962 that was originally called the Red Raiders (1962-1964). After that the team used the name of the major league franchise it affiliated with: the Cardinals (1965-1972), the Astros (1973-1974), the Giants (1975-1979), and the Reds (1980-1992). The team adopted the Kernels nickname after affiliating with the Angels before the 1993 season. It won Midwest League championships in 1988, 1992, and 1994. As an usher I see them regularly as they come to Dayton Oh and play our Dayton Dragons (Reds affiliate). there is something to be said for minor league and independent league baseball. Our local team was called the "Crushers", being in wine country and grape crushing. My son and I would attend games frequently. Buying tickets for one game, the vendor recognized us and gave us the team owners seats, right beside the dugout. That was fun. The perks of living in a small town! The minor league parks definately give you a greater value than the majors do. The players are more interactive, and the attention of the park staff is much greater. They have not forgotten what the game is all about (and it is not about the money). mikesglove wrote: Anna Burns Decker of Keokuk was listed the inventor of a catchers mitt in 1895. The patent of Decker was innovative for the method of constructing a catchers mitt out of three replaceable sections, the front face, the perimeter band and the gloved back section. All three sections were joined by lacing instead of the usual stitched seam. Decker sold her patent to Frank Brogan, Manufacturer of Baseball Goods in nearby Iowa City. 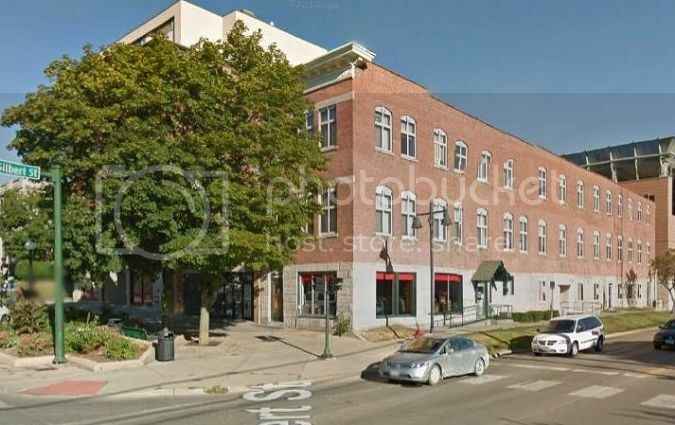 Frank Brogan and several partners began glove manufacturing in 1899 as the Iowa Glove Co. in a brand new leased building. They purchased the necessary equipment such as a power generator, sewing machines, etc. with an initial $50,000 outlay. They manufactured driving and work gloves in addition to baseball equipment and other assorted leather goods. They were in operation at least till 1917 with the emphasis on general utility leather gloves. Frank Brogan's family owned so much land in nearby Jackson Township that the town of Brogan was established in 1899 but was dissolved in the 1970's. Below is the factory building still standing at the corner of Washington and Gilbert Sts. in Iowa City. There were several renovations over the years the latest in the 1970's into apartments. When the National moves to Iowa, Brett and William can check it out. They could also stop by nearby St. Claire and say Hi to Mike and Frank. Don't forget Danielle. mikesglove wrote: By the 1940's the "Keokuk Westerns" became a minor league affiliate of major league teams and changed their name to the "Keokuk Kernels". 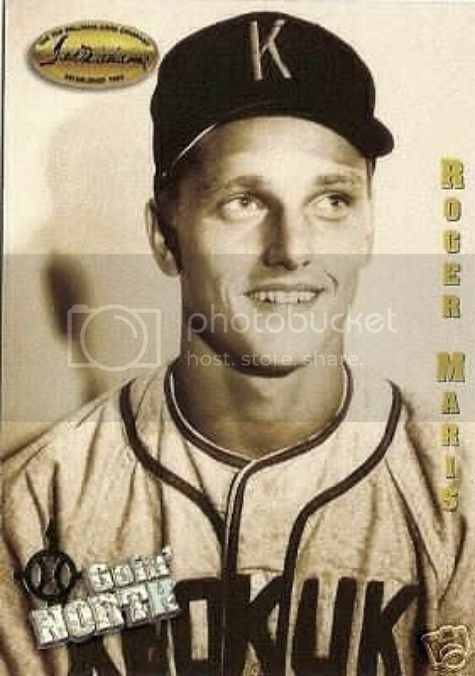 As an affiliate with the Cleveland Indians in 1954, The "Kernels" most distinguished player may have been a young Roger Maris.